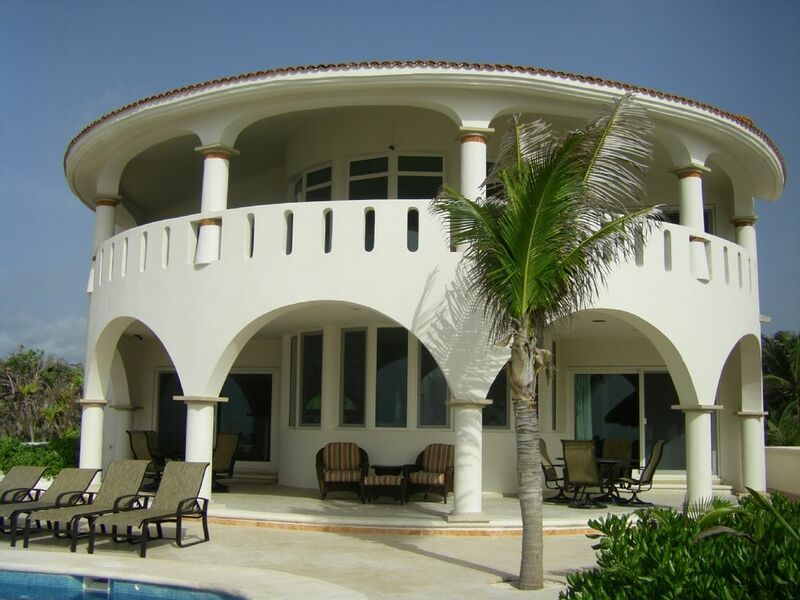 Casa Escocesa is a beautiful oceanfront villa located in Tankah, just north of Tulum. The villa boasts a very high quality finish-out and is tastefully decorated with new furnishings. It has approximately 4,000 sq.ft. of living area, 1,000 sq.ft. of covered terraces, and a sparkling 30' ocean side swimming pool (many other properties have pools located on the road side). Features also include an enormous gourmet kitchen with large island, granite countertops and stainless appliances. The 4 bedrooms all have en suite bathrooms, and offer gorgeous views of the Caribbean. The large living room comfortably seats up to 12 people. The spacious den upstairs has a 60” flat panel Smart TV, desk, and a small exercise area with a treadmill. The villa is state of the art with a Bluetooth Sound System throughout the house including rear pool area (bring your iPod! ), lighting system, and individually cooled rooms for your comfort. See below for the top 10 reasons why you should choose this villa. 1. New….villa and furnishings in like new condition, everything works! 9. Caretakers…hard working, friendly, great attitude, knowledgeable…..simply the best! Spectacular Villa with Everything You'll Need: Tastefully furnished, and with everything you could possibly need for a thoroughly relaxing vacation. Sparkling ocean side pool. Fully equipped kitchen with granite countertops and all appliances. Amenities include 60” TV’s, DVD, CD, wireless internet, Blue Tooth enabled distributed audio with iPod dock (bring your iPod! ), the most secure doors and windows available in Mexico. Treadmill and exercise ball for those motivated to keep in shape on vacation. two Two outdoor dining tables seating eight people. Roof terrace with seating for 6-8 people to enjoy a drink and the most incredible views of the Caribbean. Please note, while the beach is nice and sandy, the entrance to the ocean is a little rocky, and bootees are recommend for swimming or snorkeling. Our caretakers are the best, and will take care of your every need. In addition to their regular duties, they are also available to cook, do laundry, do shopping and baby sitting. Beautiful Mayan Riviera and Caribbean Ocean: The Mayan Riviera is a great location for your vacation. Whether you want to just relax and take it easy, or be active and do and see all that it has to offer, you will love to spend time here. The Caribbean Ocean and the cenotes all over the area provide incredible snorkeling, diving and fishing activities. The area is steeped in Mayan history, with major Mayan ruin sites at nearby Tulum and Coba. The beaches in Tulum are spectacular and uncrowded. The ocean is warm year-round and safe for swimming. The local restaurants offer good food and are inexpensive. The city of Playa del Carmen about 45 minutes drive north of Tankah offers great shopping, golf, and all the night life you could ever want. All bathrooms are finished with marble counters and mahogany cabinets. The Master downstairs features a wetroom shower, accessible with a wheelchair. Honestly the reviews do not lie!! This is the place if you are looking for a 5 star all inclusive but without all the other people. The house is beautiful, the views are breath taking and the care takers Elda and Elder along with their children and additional help are all amazing. We were a party of 8 adults and we all felt like royalty on our vacation. The pictures online do not do this house justice.. I wish I could attach additional pictures but not able to through VRBO. I cannot express how great Elda and Elder are and our sincere gratitude for their hospitality. I will tell you do not bother going out to eat have Elda prepare your meals for a minimal charge, she is a amazing cook and you will not go hungry. You can request items off her menu but whatever you do make sure to have her steak and lobster it was out of this world! The night we arrived we had dinner awaiting us along with Elda and Elder to greet us and show us around the house, they did not miss a beat from the moment we arrived until our departure. I have been to the Tulum area 3x's now and have rented other VRBO's and this one I will definitely be returning to. The beach being rocky does not takeaway from this house, walk a little ways down the beach to the left and you can walk right into the ocean. The perfect place for our group! This house was A-MAZ-ING! As mentioned in the other reviews Elda was the highlight of it all. Her cooking is fabulous and we wish we could have brought her back with us. Plan to take advantage of this feature and try the flan! - GETTING THERE: The house is locate down a dirt road off of the main road. luckily the road was just refinished so there aren't any potholes or anything, just take a while to get down the road and this house is close to the end. - THE BEACH is too rocky to get in. but a short walk will get you to a spot where you CAN get in. When I read the beach was rocky I though I could still swing it but no, this is not a swimable beach at all. HOWEVER, a short walk down to left there is a beach side restaurant with great drinks and food. and they also have kayak rentals and snorkeling tours for cheap. - THE HOUSE was perfect for our group of girls going for a bachelorette party. The two "single" beds are what we consider in the states full size beds. There is plenty of space for all, while elda was cooking inside we would be hanging out by the pool or doing silly bachlorette games in the upstairs living room. The rooftop deck is great for viewing the sunset and the stars. - GETTING AROUND. If you dont have a rental car I strongly suggest figuring out your transportation around the area before hand. we ended up over paying for a shuttle service. We had the same person driving us which was great but every ride to and from tulum was $120 and we did that twice a day so it added up. I SUGGEST contacting Elder prior to your arrival and coordinating your needs with him so that he can help find a good solution for you. Over all a great experience and we will certainly be visiting again! I spent a week at the house for my birthday with 5 friends. We loved the house so much that we rarely wanted to leave. It is a truly beautiful home and I would have loved to stay longer. We arrived in the evening to a delicious dinner that had been prepared for us (on request) and a few groceries in the kitchen that I had specified. The stars at night were glorious. We woke up to the ocean welcoming us to Tulum. Birds flying overhead, sunshine, and the sparkling pool. We really loved the deck and pool area! The master bedroom is on the main floor and has a beautiful bathroom. There are two bedrooms upstairs with king size beds (one with a really cool bricked dome in the ceiling), each with its own bathroom and access to the second level patio, and another bedroom upstairs with two queen size beds, its own bathroom, and a small balcony. There is also an entire living room upstairs with a couch, TV, and chairs. The rooftop was gorgeous for sunsets except that the seating is not very comfortable as there are no longer any bench cushions as shown in the photos. The house was cleaned every morning (except Sunday) by Elda, which was a nice luxury. They provided us with beach towels as well. There were a few negatives: 1. Because of rocks and reef, the beach is not a swimmable beach. You can walk to the left to find some areas to swim.... in between rocks and reef. We walked about a mile down the beach to snorkel and we were able to see some fish and a stingray. 2. The AC was not working in the main parts of the house and in two of the bedrooms when we arrived. We were able to get one bedroom AC fixed on the first day, but the other bedroom wasn't fixed until the 3rd day, which made it impossible to sleep there because it was too hot, and you can't leave the doors/windows open for safety reasons. The ceiling fan also didn't work so there was no air movement. We had to relocate out of that bedroom for two nights in order to have a room with AC. The AC in the main areas (living room, kitchen, and upstairs living room) never worked and never got fixed while we were there. Some repair guys came to fix them, but they were unable to. We enjoyed having the doors open during the day, so the main AC's were less of a problem. 3. There was little privacy the first few days.... the caretakers do not knock before they come in to clean or tend to things inside the house. They come and go as they please. Overall, we loved the house and would go back again! Words can not even begin to describe the incredibly wonderful experience my friends and I had at this home. While the home is in a more secluded area - it is ideally located within 25 minutes of all you need to see in Tulum. The house is immaculate- open, breezy yet homey and the views are breathtaking. I can't speak highly enough of Elda and Elder- the caretaker/groundskeeper and cook. They were incredibly accommodating at all hours of the day - the food was to die for and they were so warm and friendly always. Honestly- i could not have picked a better home, atmosphere, and staff to work with. Will absolutely be returning and recommending it to friends and family! I stayed here wth 7 friends for a bachelorette party and the house was even more beautiful than the photos. But the best part was Elder and his family. They took amazing care of us, cooking delicious meals and helping us navigate Tulum. I can't wait to come back and would stay at Casa Ecosesa again in a heartbeat. Breathtaking! Wonderful! It's like our home away from home. We have been to Escocesa 2x now. 2016 and 2018. We hope to go back again because we absolutely love it there. Elder, the caretaker, is always helpful. The house is always kept clean. And if you have meals prepared by Elda or Maritsa, you will not be disappointed. Ever. We have been on many vacations with our kids but this place by far stands out as one of the best memories. Tankah IV is a small, tranquil Caribbean ocean front development located between Akumal and Tulum on the beautiful Mayan Riviera. The beach is a nesting area for turtles in the months of May to September. There are three restaurants and a cenote for snorkeling and diving, all located in Tankah. The main highway is only two miles away and offers easy access to both Akumal and Tulum for shopping, banks and grocery stores.